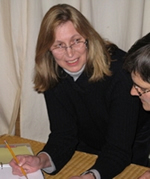 Jane Elder has been actively engaged in communicating about environmental issues and advocating for protection of the natural world and human wellbeing over the last 30 years. She was the founding director of Biodiversity Project-a nonprofit communications organization dedicated to raising public awareness about the diversity of life on Earth and the urgent need to take action to protect it. In 2002 she received the Bay Foundation Biodiversity Leadership Award given to "individuals with proven capacity to help stem the loss of biological diversity." Previously, Jane worked for the Sierra Club, heading its Midwest office for many years during which she founded the Sierra Club's Great Lakes program and later served as the national director of Ecoregion Programs. Her policy work spanned air and water quality, toxic pollution, parks, and wilderness. She received the Sierra Club's Michael McCloskey award in 1994 for "a distinguished record of achievement in national or international conservation causes." She holds degrees from Michigan State University (B.A., Communications) and the University of Wisconsin, (M.S., Land Resources). Jane currently consults on strategic communications for social change, with an emphasis on complex environmental challenges such as biodiversity loss, global warming, ecosystem restoration, and the role of participatory democracy in achieving effective solutions.